Sometimes your old tools are your best tools. Take the typewriter, for instance. 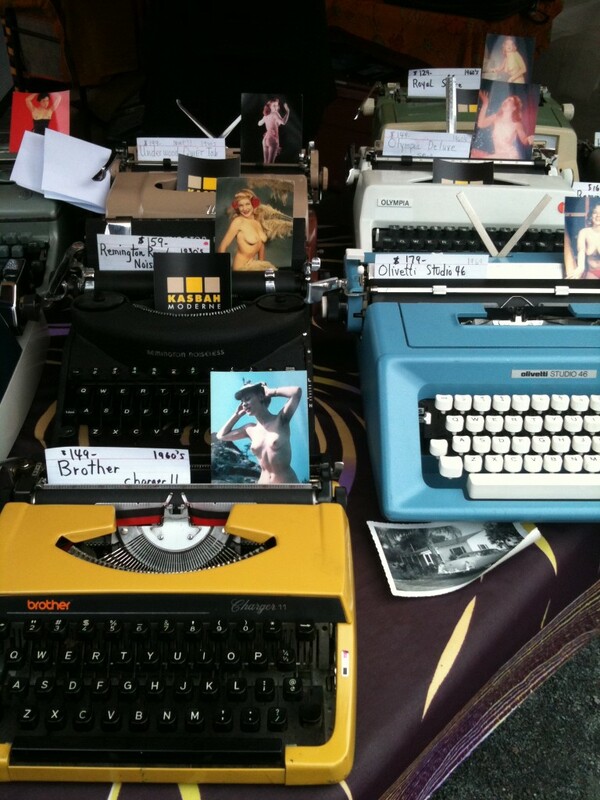 There has been a resurgence of typewriters in my life. At work on Friday I needed to fill out a government form and the form instructed me to type my answers neatly. I couldn’t find a typewriter in the entire building so I didn’t complete the government form but still! Being asked to type my answers was quite charming. Recently a friend bought a typewriter for her son and he is digging it, although I believe he told me that it did not have a ribbon. Or maybe it is missing some letters, I can’t remember, but his enthusiasm for the machine was also charming. I think those postcards were tributes to charming ladies who can type 80 words per minute! There was some old school knitting too this weekend, because while vacuuming the house to prepare for the Rapture I found a few knitting needles under the couch. (I was hoping if I went, the couch could come with me, because isn’t it Heaven to lay on the couch on a Saturday afternoon?) For a long time I’ve been using circular needles exclusively. They are easier on the hands, for one, and you don’t have to worry about needles rolling underneath the couch never to be seen again until the end of the world. So while I was waiting for 6 pm to roll around, having finished the vacuuming and actually thrown away some of the laundry I didn’t feel like doing, I broke out the Jack Frost Two Needle Mitten book that I purchased at the McCrory’s in New Brunswick, NJ in 1979 to replace the worn out one I’d bought at the Woolworths in Hoboken in 1969. Before you could say “No Dye Lot Acrylic Pull Skein” I had whipped up a pair out of some leftover Brooks Farm red. If you would like a copy of this instructional leaflet, please send me a self addressed stamped envelop and I will gladly mail you a copy. Knitting A Mile Square is powered by	WordPress 5.1.1 and delivered to you in 0.223 seconds using 42 queries.